Dry weather over the last two years has put the South East, East Anglia and parts of Yorkshire into drought. But the Environment Agency say that this makes the possibility of flooding even higher should we receive heavy rainfall, as the dry compacted earth is less absorbent of water. 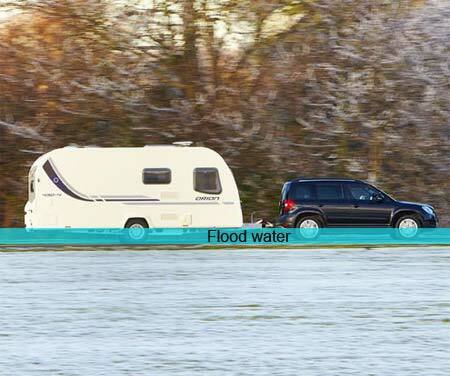 So what should you do if you encounter flood water when towing your caravan? How deep is too deep? The depth of water which a car can safely drive through is known as its ‘fording’ depth, and is often much less than you would think. The main issue is the possibility of water getting into the car’s fuel system through the engine’s air intake or exhaust pipe, something which can cause serious damage. Different cars will obviously have very different fording depths dependant on a number of factors including the height of the air intake and exhaust. For example a Land Rover Freelander 4×4 has an official fording depth of 19”, meaning anything over about a foot and a half shouldn’t be tackled. That may sound a little low for something which is considered an off-road vehicle, but the depth that can be safely tackled in a normal car is even less, usually somewhere close to the centre of a car’s wheels. Check your car’s manual or manufacturer’s website for more info on this. However, as you can see from the picture above, the depth that is safe for your car to drive through isn’t necessarily safe for your caravan because of the caravan’s floor vents which could be lower than the towing vehicle’s fording depth. Any water which gets in to these could potentially flood the floor of your caravan and cause severe damage to carpets, floors, upholstery and wooden units. Add to that the fact that flood water isn’t usually the cleanest (often containing varying levels of sewage or farm runoff) and you’ve got a situation which is best avoided altogether, with water of just a few inches being the only safe depth a car and caravan outfit should tackle. Of course we acknowledge that caravans can be susceptible to flood damage even when all necessary precautions have been taken to avoid it. In recent years, several floods in the UK have resulted in numerous caravan write offs. Flood damage is of course covered by Caravan Guard’s caravan insurance policy, but if you have any questions or queries then please don’t hesitate to give us a call or use the contact form here.